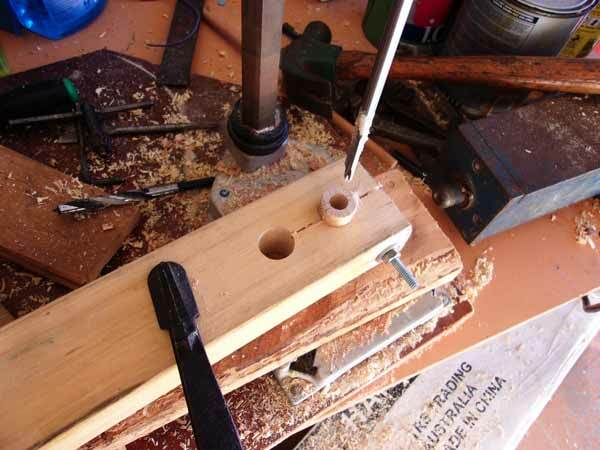 Drill a hole through the long end of a dowel. As time goes by, I will be posting a few more woodworking tips and tricks. Subscribe to my newsletter to stay informed. A large part of the fun you can have in making things with wood is making your own tools and jigs. Some jigs are for a specific purpose, others can be put to more general use. In my humble opinion, the workbench is one of those universal woodworking jigs. Here is a link to Jim Barry's listing of workbenches and jigs. Do you have a woodworking jig, tip or technique you would like to share? You could use the form and the end of this page to contact me, and I shall create a page just for you. The way I normally make wheels for toys is to use a circle cutter – I am happy to do this for wheels up to about 70mm in diameter. Making anything bigger makes me feel less comfortable. This is how I make large wheels using a disc sander and a very simple but effective jig. When I say large wheels, I mean the size of wheels that cannot be made using the fly cutter, which is another method for making wooden toy wheels. 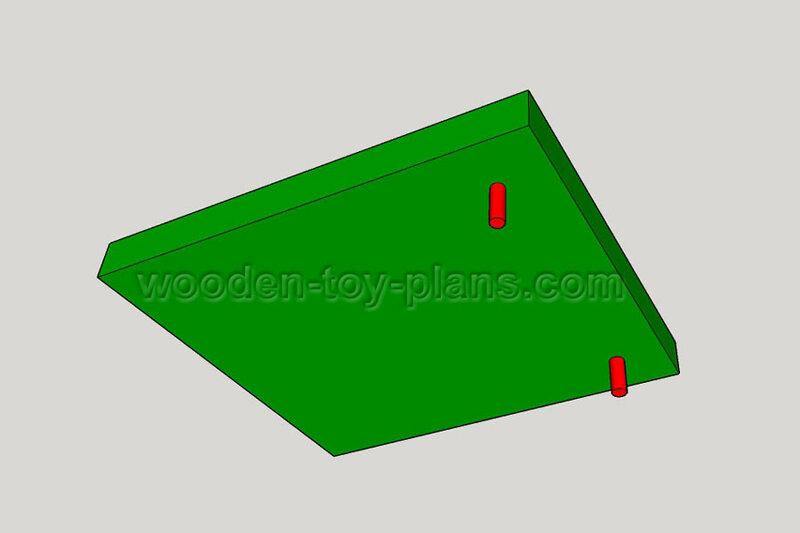 In the image above, the green represents the jig, very similar to a bench hook. The blue disc is the wheel, and the red dot in the middle is the axle. Showing the underside of the wheel making jig, with two dowel pins fixed in place. Once again the top of the jig, this time without the wheel to show the dowel. 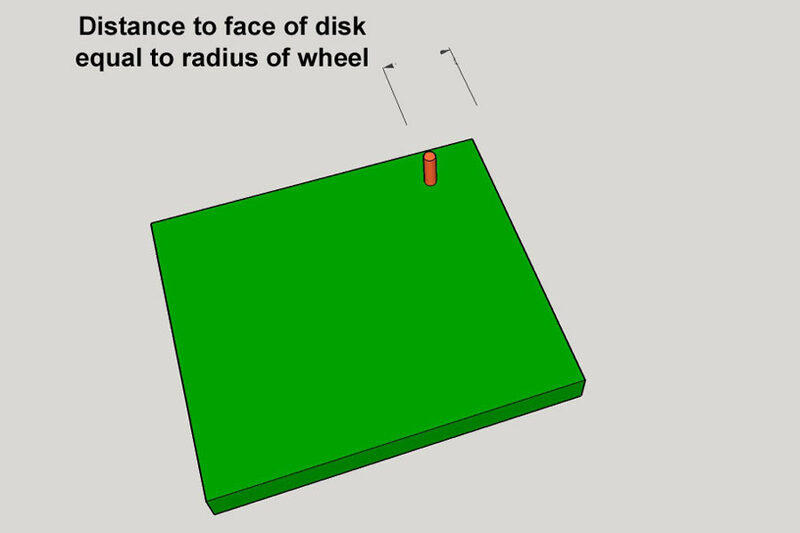 Measure the radius from the face of the disc to drill the hole. I use the same jig with holes at different radii for wheels of different sizes. Note that the dowel is a press fit, not glued in place. To do this, I cut a slot in the dowel to make it easier to insert and remove without being too loose. Woodworking Tip: Note that it is good practice to cut the slot in the dowel along the grain and not across it. Start by marking out the size that I want using a pair of compasses. Sometimes I paste a paper template onto the work-piece. Whichever works best, and the important part is to drill the hole for the axle first. Using a scroll saw, a band saw or even a jigsaw, I cut out the disc as close to the line as possible trying not to touch it. Place the rough cut disc on the dowel, it should be able to rotate freely without too much slack. Start the disc sander, and place the jig on the table with the underside dowel diagonally across from the wheel touching the edge of the table. 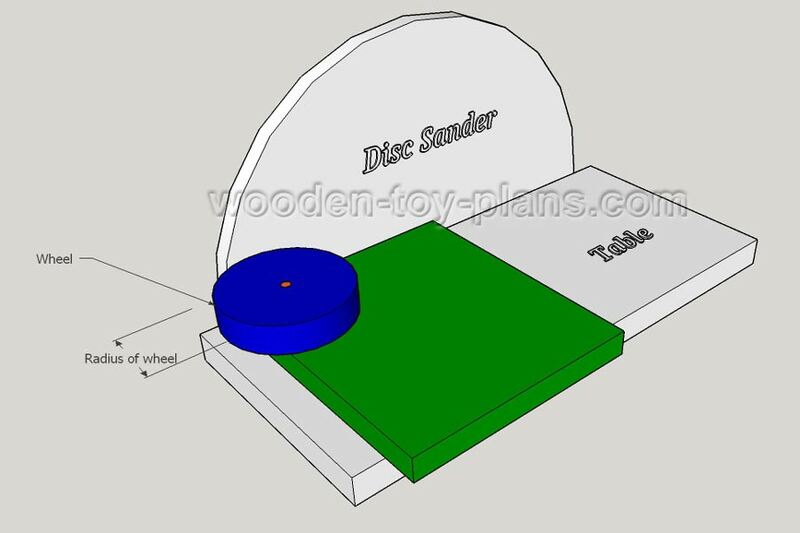 This allows me to pivot the jig by applying gentle pressure against the sanding disc and rotating the wheel at the same time. Too much pressure and you burn the wheel. Slow and gentle is best until you have turned a complete circle, sliding the jig back and forth as you would with any other work-piece. Viola! You now have a perfectly round large diameter wooden wheel. Not only that, you can make as many as you want and they will all be exactly the same size. I saw a video online about how to drill a hole through a dowel. Clamp the drill upside down in the vice, and the dowel mounted in the drill chuck. To align the drill in the vice, first insert it upside dowel in the chuck, then clamp it in the vice. Release the drill and insert the dowel. The hole is drilled by spinning the dowel, similar in principle to a lathe. Sounds simple enough, and it is. But what if the dowel is too big to fit into the drill? Sometimes not having a particular tool can lead to making something that is even more useful. 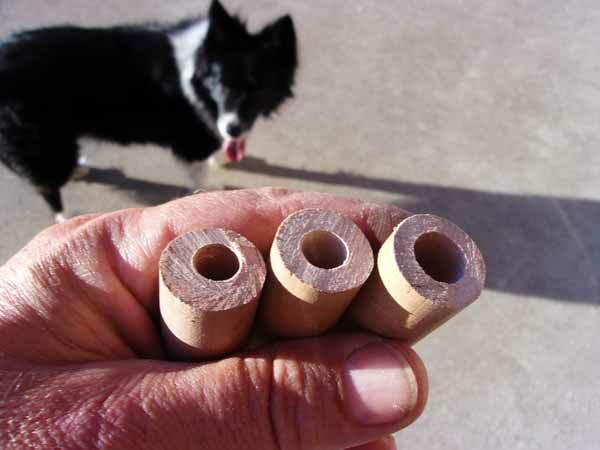 I needed a way to hold a 19mm diameter dowel, about 50mm long, in order to drill a hole through the long end. I don't have a vice, so I had to make a simple clamping jig by drilling a hole into a block of wood. This is how I did it. First you will need a bit of scrap two by four, which in this case measures about 38mm thick and about 75mm wide. Length does not really matter as long as it is long enough. Drill a hole neat one end to the same diameter as the dowel. I used a spade bit, but I think a Forstner bit would have been better for reasons that will become clear later. The dowel should be a snug fit, but I also wanted to make sure it could be clamped, so I made a saw cut through the centre of the hole, and drilled another hole for the bolt that you can see in the photo. Why the second hole? To give the saw cut a bit more flexibility when bolt is tightened to clamp the dowel. This was the original intention – to drill the hole for the clamping bolt and the second hole to make it more flexible. Make the saw cut, clamp the piece in position, drill the hole with the spade bit, or Forstner bit if you have one. Leaving the piece clamped in place, insert the dowel and clamp it with the bolt. Be careful not to move anything. Remove the spade bit and insert the next drill bit. A brad point works better for drilling holes in wood, but I don’t think you can get them smaller than 6mm. Here’s a few examples of what I made using different types of drill. Starting from the left, that was a more common 10mm metalworking drill bit, as you can see it’s not quite in the middle. Next is a brad drill bit, could be a little better with a proper drill press. On the right is a 12mm spade bit. These pieces are about 50mm long, just to see how it works. With a proper drill press, I’m sure it would be possible to drill through longer pieces of dowel by drilling through one side then the other. Forstner bit would be better because it would be more accurate to align the clamping jig. 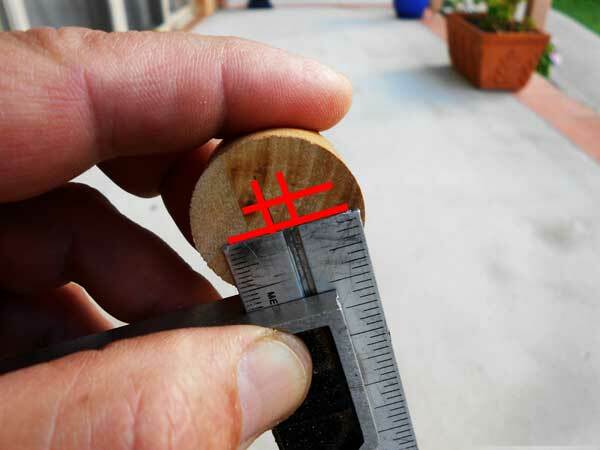 Another tip is to mark the centre of the dowel with an indentation made by a centre punch. To be more accurate, I would need a drill press. All I have at this stage is a drill guide made by Wolfcraft, with a small modification to accept my trusty Hitachi drill.